Use the power of technology and social networking to pay dividends back to your business. Facebook is huge. You know this, and you know that chances are most of your customers are using it to some degree. You probably even use Facebook for marketing your venue—announcing specials or upcoming events, posting photos or videos, and so on. 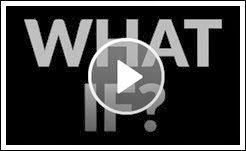 But have you ever thought about how your customers, by sharing what they’re doing to their Facebook network, could also help to promote your business? To help us get a sense of how powerful Facebook can be, let’s take a look at some numbers. In its December 2015 usage figures, the social network reported a total of almost 1.6 billion users around the world—in other words, more than one out of every five people on the planet has a Facebook account. In the United States and Canada, 219 million people access Facebook at least once a month and, incredibly, 169 million of those users (or about 65%) access the site on a daily basis. An important side note to consider is that, according to Facebook itself, over time the percentage of users who visit the site at least once per day is increasing. In short, more people are using Facebook and doing it more often. So what does all this mean for your venue? This is where myJAM comes in. With myJAM, there’s now a way for you to enlist your customers to work as your brand ambassadors, spreading the word about your venue to their social networks in a manner that gives you more value than you’ll receive from just placing ads on Facebook. When you enable access to myJAM in your music system, you can encourage your customers to download and use the myJAM app. Once they’ve done so, they can use it to “check in” to your venue and make song requests—then share all of this with their Facebook social network. Keeping in mind that your customers’ social networks are, in general, going to be largely composed of people from the same demographic, this means that these Facebook shares are inherently targeted to potential customers very similar to the ones you already have. 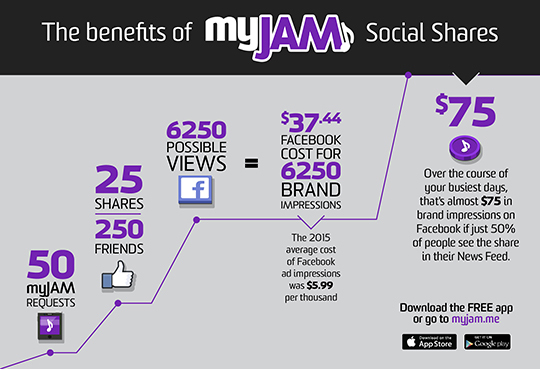 And not only that—when a customer uses myJAM to share on Facebook, that share is particularly valuable because it’s tied to a customer who is actively at your establishment right now.